Thinking of buying a used MPC1000? I don’t blame you, the MPC1000 remains the most popular MPC ever, with it’s compact size, upgradable OS and plethora of custom upgrades – and you can still easily pick up a mint condition second hand MPC1000 on Ebay for a very reasonable price. But as you browse the Ebay and Gumtree listings, you’ll soon realise that there are many different ‘flavours’ of MPC1000 out there; different colours, different screens, different operating systems and many other custom add-ons, so let’s take a look at some of the most important things a buyer of a used MPC1000 should be aware of. When Akai originally released the MPC1000, they decided to change the technology behind the famous MPC pads. Until that point, all MPCs had utilised a single sheet of pad sensors on which a single sheet of pads sat on top. With the MPC1000 there were now sixteen individual pad ‘units’, each one comprising of a single rubber pad with a single sensor underneath it, and it’s own unique connection to the MPC1000 mainboard. The stiffness got progressively worse over time until eventually some of the pads would simply cease to function. Eventually Akai changed the pad design back to the more traditional single sensor array and these new MPC1000’s played beautifully. For existing MPC1000 owners, a paid ‘pad upgrade’ was offered by Akai which involved swapping out the old sensors with the new single array – this MPC1000 pad upgrade is still available from MPCStuff.com. The problem when buying a second hand MPC1000 is that it might have the old style pad sensors inside it. If so, you may eventually have to purchase the MPC1000 pad upgrade fix (which costs approximately $200). So how do we know what type of pad sensors are being used? Has this used MPC1000 got the new style pads? First, let’s get the urban myth out of the way; the colour of the MPC1000 is NOT a completely reliable indicator of the type of pad sensors used. You’ll usually see two different colour MPC1000s; blue and black. The blue MPC1000 was the original release, briefly followed a couple of years later by the black MPC1000 with a bare metal backplate, then finally the black MPC1000 with a black backplate. At some point during the final ‘black backplate’ period, the new pad sensors began to be factory installed, but there were some runs of the black backplate models that had the old style pad sensors. So buying the ‘complete black’ MPC1000 is no guarantee of the new style pads. While the blue and unpainted backplate styles did originally come with old style pad sensors, it’s very possible that at some point a previous owner has upgraded the sensors to the new style. So again, casing colour simply cannot be trusted. 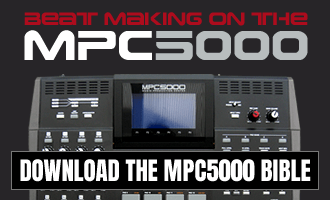 One guaranteed method is to open up the MPC1000 and take a look! That is unfortunately not usually practical, so the next best option is to try the ‘wiggle test’. The wiggle test involves grabbing the edge of an MPC1000 pad and simply wiggling it around. If the adjacent pads also move slightly, then you have the new style pad sensors. Rejoice. If the adjacent pads don’t move, this is because each pad is a completely isolated unit and hence the MPC1000 will contain the old style pad sensors. Some people claim that the ‘new style MPC1000 pads’ started occurring after a specific serial number found on the MPC1000 backplate – (21)K10707022305506. This originally came from a post on MPC-Forums.com where the poster claimed he was told this by an Akai support rep. To date, this claim hasn’t been reliably proven so I’m not going to recommend it, especially as there is nothing stopping some shady seller taking out the ‘new style’ pads and placing them with old style ones. Another way to pretty much guarantee ‘new style pads’ is that the MPC1000 already has MPCStuff ‘fat pads’ installed. These can only be installed in an MPC1000 with the new pad sensors (more about MPC1000 fat pads later in this article). If you are buying on Ebay I’d advise you get the seller to first confirm what style of pads are inside your MPC1000, or just stick to listings that already clearly state that the MPC1000 contains the ‘new style’ pad sensors. If the seller is lying you should be covered by Ebay buyer protection, as the seller is misrepresenting the MPC1000’s specifications. Which MPC1000 Operating System Does It Run? 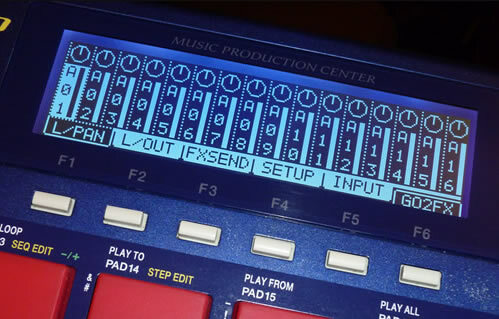 The MPC1000 originally ships with the official ‘Akai OS’, however there does exist a third party MPC1000 OS, called the JJOS, which can be installed into an MPC1000 very easily (you can revert back to Akai OS at any time). I have a section of this site dedicated to JJOS tutorials. There are actually many different types of JJOS, one version is free to use and is similar to the Akai OS but has some important improvements and bug fixes, this is usually referred to as JJOS Free. All other versions of JJOS have saving disabled until you purchase a license, but these paid-for versions give you access to many more advanced features. Once installed, this license is forever ‘attached’ to this particular MPC1000; it’s not a ‘user’ license, it stays with the machine and you will not need the previous owner to supply you with a password, nor will you have to contact JJ about the sale. Clearly an MPC1000 running one of the paid-for JJ operating systems should be worth more than one running Akai OS (or one running the free JJOS), but the additional value depends on which version of JJOS is installed. The top of the range JJOS is OS2XL, which (at the time of writing) costs $123 – once the OS2XL password is entered into your MPC1000 it is saved permanently and will also allow you to install other JJOS versions as well– specifically JJOS3, JJOS2 and JJOS1. In fact you cannot install JJOS3 without first purchasing JJOS2XL. JJOS1 is the most basic ‘paid for’ JJOS and can be purchased for $59. You can upgrade to JJOS2 for another $59. You can upgrade to OS2XL/OS3 for a further $15. So in a nutshell, if an MPC1000 is advertised as having ‘JJOS installed’, make sure you know exactly which ‘flavour’ of JJOS it actually is. Don’t pay extra for the ‘free’ JJOS! In my opinion, only bother paying a bit extra for your MPC1000 if a JJOS2XL license has been purchased for this machine. Again, if buying on Ebay, ensure the buyer clarifies this in the listing or through Ebay messages. Official MPC1000 Upgrades – Are they worth it? As has always been the case with Akai samplers, the ‘out of the box’ MPC1000 came with a pitiful amount of system memory (16MB) which severely limits the amount of sampling time available in the currently loaded project. So the essential upgrade for all MPC1000s is the maximum 128MB RAM (it is NOT possible to get more memory recognised in an MPC1000) – this can be the official Akai memory board (overpriced), or standard computer RAM (to the required specifications, where you have to actually purchase 256MB RAM but only half gets recognised by the MPC) – this is significantly cheaper (around $20 these days) and just as reliable. Either way, as you can perform the upgrade for around $20, the amount of memory in your MPC1000 is of minor relevance. You can get a list of compatible MPC1000 RAM from MPC-Forums.com. Do not confuse ‘system memory’ with references to the ‘memory card’, which is normally just talking about the compact flash card that the MPC10000 uses as its default storage device (just as older MPCs use zip disks or floppies). These are just standard compact flash cards that you can pick up on Ebay or Amazon for pennies, so again, don’t let this influence your buying decision. You can also install an internal hard drive in the MPC1000. This requires that you purchase a HDM-10 mount kit and a hard drive to fit inside it. It’s a useful feature for large and convenient storage, but does introduce hard drive noise into what is otherwise a silent MPC (CF cards are noiseless). Many MPC1000 owners don’t bother with this, but if you think you’ll use it then it would be worth paying a bit extra, especially as not all hard drives are compatible, so it saves you the hassle in hunting one down. Companies like MPCStuff have developed a number of optional upgrades for the MPC1000 and the addition of some of these can certainly add some value to a used MPC1000. 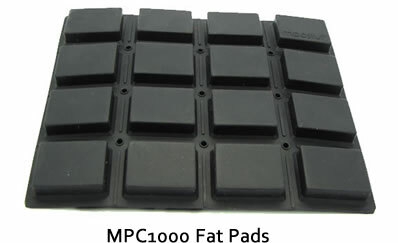 Perhaps the most famous are the MPC1000 ‘Fat Pads’ (also available for all other MPC models). These pads are thicker and more sensitive than the standard MPC pads, look pretty cool and come in a range of colours. Cost is approximately $40 and installation is easy, so it shouldn’t be a deal breaker on its own. You can also replace the standard green/yellow LCD display with a range of different colour screens. These custom screens cost around $100 or more, so if the MPC1000 comes with this upgrade (assuming you like the screen colour), expect to pay a bit more for your MPC. If you are in the UK or EU, I can source the following ‘midnight blue’ MPC1000 displays for shipping directly from the UK (so no customs fees or delays) – please get in touch if you are interested. MPC Stuff also supply an MPC1000 large screen upgrade (approx. 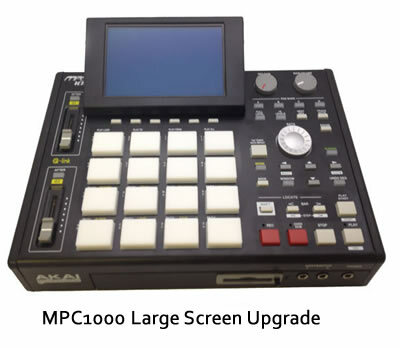 $200) that gives your MPC1000 a screen similar in size to an MPC5000/MPC4000 – it even comes with its own special version of JJOS (JJOS128, which is the free version of JJOS adapted for the larger screen). There’s also the option to pay $98 for the upgrade to JJOS128XL, which is the large screen version of JJOS3, featuring lots of advanced bells and whistles. If your MPC comes with the large screen and JJOS128XL, there’s nearly $300 of extra value there. If you do buy a ‘large screen’ MPC1000, ask the seller to see if they still have the original LCD display, as this gives you the option to revert back to the standard screen should you not like the large screen upgrade. You can also upgrade all sorts of features, like different dials and knobs, different colour LEDs (the lights used to illuminate the buttons), wooden side panels etc. 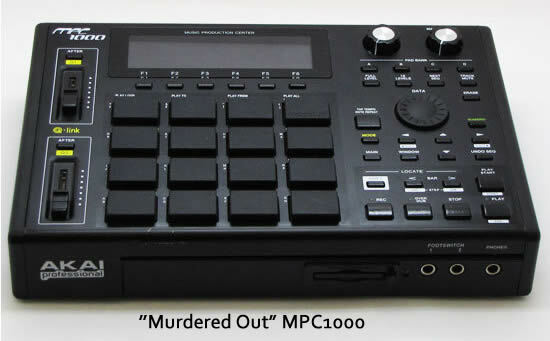 Often you’ll find MPC1000s that have been completely customised along with a new paint job – a ‘murdered out’ version is very popular featuring all black buttons, black pads, black LCD screen, black sides etc. Expect to pay over the odds for these models as the seller is usually a commercial outfit who pimp MPCs for profit. Check to see if they offer any kind of warranty, especially if they’ve been messing with the electronics. When buying a pimped MPC with a new ‘paint job’, check to see if it is actually paint or just a vinyl sticker. These vinyl stickers/decals are available ‘off the shelf’ from places like Style Flip and are pre-printed and pre-cut to fit your MPC1000 perfectly. However, they don’t have the same finish as a quality paint job with screen printed lettering added afterwards. One advantage of these stickers is they can be removed very easily, so if you don’t like them you can always go back to the standard MPC1000 finish – however those stickers might be hiding all manner of scratches! Unless you are buying a custom painted MPC, you can most likely expect a used MPC1000 to show signs of wear and tear. Visually you should expect scratches, both on the body and potentially on the clear plastic in front of the LCD display, and very often all sorts of scratches around the back where the last owner has been blindly trying to put 1/4 inch jacks into the sockets at the back. The pads may be grubby, but this can usually be washed with an appropriate cleaner. If buying online, stick to listings that provide large, detailed images showing multiple angles, with closes ups of the screen so you can see what scratches there may be. The screens themselves are not known to have any long term problems (they don’t get the lines like the older MPC2000/XL screens did), so you should be fine there. However some electronic components of the MPC1000 are notoriously poor quality and can eventually fail, mostly the ‘tact switches’ that sit under each and every button – eventually these start working erratically until they just stop working and need to be replaced. Unless you are a soldering wizard, you’ll need to get a specialist to perform this work for you. The data wheel can also eventually experience erratic behaviour – replacement MPC1000 data wheel encoders are available from MPC Stuff, but again, soldering is required. the Q Link sliders also tend to get a bit of a rough ride, so it’s good to see fi these are both working correctly. I’ve already mentioned the problems with the original pads, it’s not unheard of for people to sell MPC1000s with some pads either not working at all, or with some pads working erratically, so beware. Often you’ll see Ebay listings where the seller briefly mentions that some pads need ‘slightly harder pressure’. If so, avoid this MPC1000, or budget for the pad fix. Another thing to check is the CF card tray. Inside this are a few dozen metal pins – these should all be present and straight – if there are missing or bent pins then it is likely that your CF drive will not function correctly. This can be a costly repair. Once you’ve received your used MPC1000, make sure you carefully check the machine to ensure it is functioning correctly and meets the specifications defined by the seller. You will have to grab the MPC1000 manual first so you know how to perform some of the basic tasks, or better still, grab my ‘Beat Making on the MPC1000’ tutorial book as this will teach you all you need to know about using the MPC1000. If you have any friends with MPCs, get one of them to check it out as well. Check the general visual condition – if you purchased online, does it match the photos in the listing? Are there any obvious signs of additional damage which may have been caused during shipping? Any unusual rattling sounds (if you gently shake the MPC1000, it should remain silent). Switch on and connect your MPC1000 to your sound system or via headphones and perform an initial check to see if it boots up and the screen works. Upon boot up the MPC1000 will also display a splash screen that indicates the amount of memory installed – make sure this matches the claim by the seller. Download some samples and programs from my free MPC1000 sounds category, transfer to a CF card via USB and load them into memory. Hit each pad and make sure the pad itself works – turn off full level and make sure the pad remains velocity sensitive (i.e. a soft pad hit results in a quieter output. Are all the audio outs working correctly with no cracking? Does the headphone output work? Check the operating system version – MODE and pad 10 (OTHER). The free JJOS is shown as ‘JJOS: 3.16’ (you may not be updated to the most recent version though), while ‘paid-for’ JJOS will indicate the OS type (JJOS1, JJOS2 etc). Check all the buttons, sliders, knobs and the data wheel. Does everything seem to work correctly? If your MPC1000 has an internal hard drive, go to the LOAD or SAVE screen, select the hard drive and check the stats provided. Make sure it’s the correct size and that it loads and saves correctly. Run the unit for a few hours and check the overall temperature of the casing – it will get warm in places, but it shouldn’t be uncomfortable to touch. If it is, this may indicate an internal electrical issue. Should I Buy a Used MPC1000? 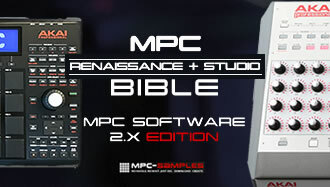 Yes, definitely, it’s a great MPC with a massive number of upgrade options and most importantly it’s very well priced. Just know what you are buying – there’s nothing wrong with buying a basic blue model with no upgrades and the old style pads as these can be purchased really cheaply if you bide your time; as long as you are aware of the pitfalls and potential upgrade and repair costs. But if I were buying an MPC1000 on Ebay today and I wanted something ready to rock with great performance, reliability and good feel out of the box, I’d be looking for an MPC with the new style pad sensors, fat pads, JJOS2XL and 128MB RAM. All the other bells and whistles are nice, but I can add those later if need be. One thing I didn’t cover in this article is suggested pricing. That’s because pricing varies by country and also by time of year – I see MPC prices rise and fall at different times, especially on Ebay. My advice is look around to see the general pricing at the time you are looking to buy – not just Ebay (which tends to be quite expensive unless you are very lucky), look at other sites like Gumtree, Craiglist, magazines, newspaper ads, shops like cash convertors etc. I have written two critically acclaimed tutorial books for the MPC1000, ‘Beat Making on the MPC1000’ (suitable for Akai OS and the free JJOS) and the ‘JJOSXL Sampling Bible’ (suitable for JJOS2XL). These books all feature carefully constructed, interactive, step-by-step beat making projects that teach you all the skills you need to become a master MPC1000 beat maker. The books both feature clear screen shots, detailed jargon-free instructions and include all the files you need to recreate the tutorials in your MPC1000, do everything is very much ‘hands-on’, for the most effective learning experience. Any thoughts on a used MPC 2500? Is the 2500 a much better choice than the 1000? Does the 2500 offer more options, especially with USB? Hi Andy, nice article, unfortunately I came upon it a little late (a couple days too late). However, I bought a first generation ‘blue’ model which works just fine for 300€ (or £212 at present rates), so I guess it’s worth it. But I’d be interested to know, since I didn’t have a chance to try out dozens of machines before hand, is it worth doing an over-hall on these things to bring them up to date. The mpc1000 that I bought I suspect has the old style single pad sensors, if what you say about wiggling to test them holds well. The pad N°2 is not so sensitive as the others, even with adjustments. Lastly my buttons work fine if a little old – I think the erase button is starting to go as its loose (not the tact button). I’ve looked up the prices of the stuff needed (pad replacement set and a set of switches) on mpcstuff.com come to about £130 + pp. So, any thoughts, what do you suggest? I’d only replace what you need to replace. If some pads are starting to fail then the pad sensor upgrade is worth it, no question. TBH I’d get this regardless. As for the buttons, you can replace these as needed, the ERASE key isn’t a high traffic button so I’m sure you can live with that being a bit loose, it will probably be fine for years. Thanks, I think I might go for it straight away as you suggest – I’ll check with the guy I bought it off, but I’m 90% sure its an old set, they’re quite ‘resistant’. As for the ‘erase’, you may laugh, but in fact since I pushed the button which as I said is now loose – I guess I must have snapped one of the attaches – it works much better (i.e. Its easier to use!). Thanks for your replies (on both topics – I asked about Logic 8 elsewhere). Great read… Just want to share this because I caught the greatest deal on a used mpc-1000. Found one in a local Trade-It store for $80. After buying at of never used original pads and a memory upgrade from ebay, my grand total was about $125. That has been over a year now with no problems.. I also had to fix some things on my recently bought 1000. As for your first (and worst) problem: Go for the LOAD screen (Mode + Pad 2) and see if there is anything shown / if the CF is loaded by the mpc. If so try sampling something (Mode + Pad 5) through the input jacks and hear if it plays back when assigned to a pad. If it does not, you can still try to assign the sample to one of the AUX Outs (1,2,3 or 4) via Program (Mode + Pad 7) -> Out. If non of it works – I guess it is some memory / CF Card Issue as you already guessed. If one (or all) of the other outputs works, I guess the main jacks are broken. On your 2nd issue: The Plastic buttons tend to break sooner or later there is a youtube video on how they can easily be fixed, using double sided tape: https://www.youtube.com/watch?v=OQ5ScgSAK4E – I have not tried it but many commentors say it works. If you have problems with tactile switches not responding (the electrical component beneath the plastic) – they can be purchased for a few cents each and are not too difficult to replace if you have had a soldering iron in your hands before (or got a friend who can do it for you). Just search for a guide on how to disassemble your machine (1000 is easy to to) if you want to take a look at its guts. Is the mpc1000 up to date to purchase with the resent jjos2xl update in Jan 2018?